Earlier this week, I flew back into Toronto after a whirlwind adventure overseas. Part 1 Paris. Part 2 London. All Parts Deliciously Fun. Except for opening my phone upon arrival home to see the news about Notre Dame on fire. Why does the world care? Because we are all tumbling into a digital black hole of platform existence only. Clinging to artifacts and icons helps remind us we were here once. London is full of those reminders. Here’s some of the wonders. Tube Envy. As a Torontonian stuck with a 1970’s transit system, I cannot say I exactly enjoyed zipping about London’s uber-efficient Underground, otherwise known as the Tube —after all, like any busy metropolis, it was often crowded with passengers chomping on full dinners. Then there’s that recent Transport for London study indicating the network’s nasty pollution problem. Many of the Tube lines run far deeper underground than other famed systems in Paris, Berlin or NYC, as I discovered in one of many Dumb Tourist Moves: walking down a very deep winding (and claustrophobic) staircase we later learned was only for emergencies—but that I was impressed as hell is a fairly sufficient snapshot. How can I not be? The sheer breadth of the grid and efficiency of moving millions of users made me green. This alone is what stalls Toronto from being anything close to world class. Old and New Awesomeness. Time travel is very real in London. 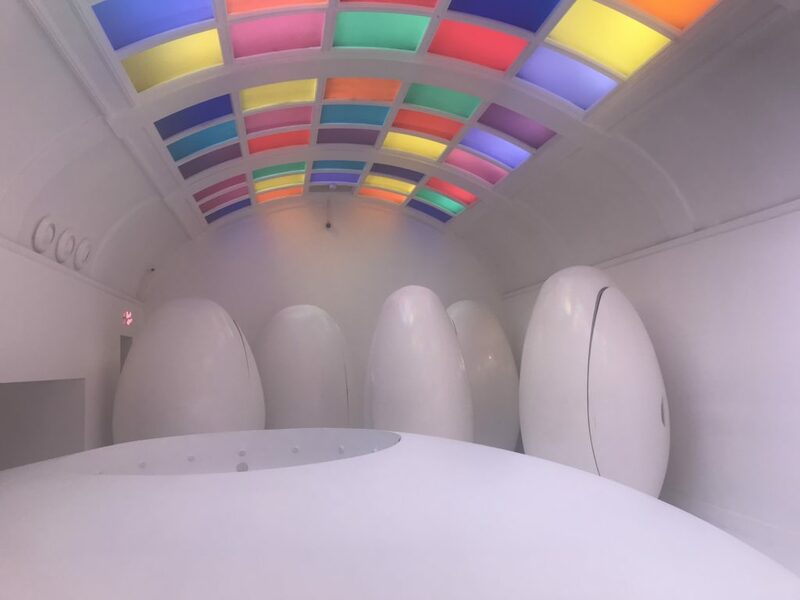 Just use the sci-fi bathroom pods at Sketch, after your afternoon tea that begins with a boater-festooned waiter offering caviar. 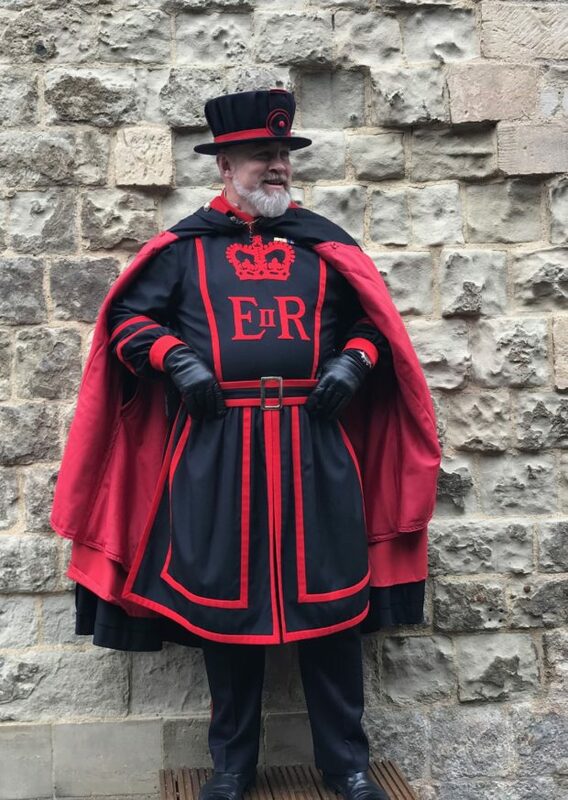 Take the Beefeater tour at the London Tower: our excellent Yeoman Warder told the many UK kids on Easter holiday among our group that no, “this is not Harry Potter theme park and this is not a costume. But there will be lots of talk about death, torture, and execution.” Who needs Fortnite here? Walk the Classic old Westminster Tour (try for a Tuesday and you’ll get the clever Judy as we did, winner of the London Tourist Board’s prestigious Guide of the Year) and hear about suffragists and not just stuffy history lessons, and gossip (the folks at Westminster Abbey practice for the Queen’s funeral every six months). Visit the gorgeous baroque St. Paul’s Cathedral on a site that stretches back to the year 604, and see the first permanent video art installation of any cathedral in the world. Contemporary artist Bill Viola’s Martyrs, installed in 2014, is as biblical as it is modern. Stand at the charming entrance of Liberty, founded in 1844, inhale the bevy of blooms, and then venture inside to peruse the famed silk prints and latest designer fashions, all housed in this magnificent Tudor revival building. Even if you don’t walk out with one of their signature purple bags, a walkabout this store is time travel of the best kind. Sunday Pub Dinners and Patio Heaters. Ok, so my ancestors are all Brits, Scots, and Irishmen so shoot me if I love nothing better than a roast beef with Yorkshire pudding, despite the many other excellent dips into international cuisine. And while drinking outside in the damp gray mist that is often London’s forecast is hardly my cuppa, I couldn’t help being cheered by the crowds outside all the pubs as we walked the many neighbourhoods. The answer? Patio heaters. I need some myself to extend the seasons of my Canadian deck and bring a little pub fever home. What is your first reaction to the work? Why does it make you feel or think like that? What is it made of? …Does the size of the work affect your experience of it? One summer I took a poetry masters class with the wizard that is Ken Babstock. Among the gems I walked away with was the gap between a writer and reader: your job as a poet was to eliminate it. To extrapolate here, this too should be the job of every curator in the world. Why have public spaces devoted to stunning artifacts without making a transparent context for visitors to enjoy them? To quote the chirpy Tube announcers, mind the gap! Portobello Market. 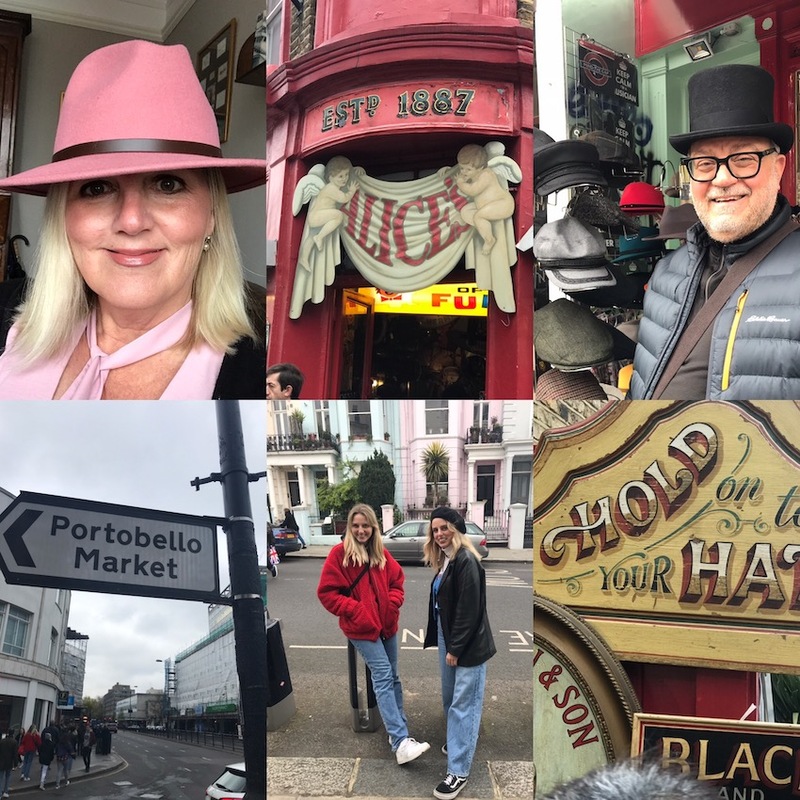 No, Hugh Grant didn’t inspire our visit to Notting Hill nor did his film character’s description of his favourite part of London miss the mark. Except now, ever since that popular 1999 rom-com, it is filled with tourists. So is every other part of London: try the hordes at Buckingham Palace for the Changing of the Guard. ( Yes, go. There’s room for everyone on the palace grounds. It’s kinda big). 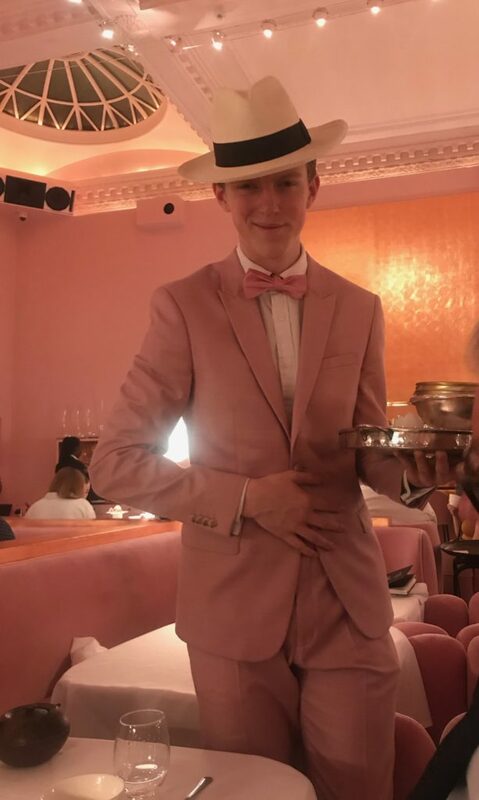 Still, traipsing about the stalls of the endless stretch of the weekend market was a total kick back in time, lending me a hit of one of all time favourite authors, Charles Dickens as I tried on fabulously fatuous hats at Sara Tiara and perused crockery at Alice’s. This is playing dress-up and tea party at its very best: I bought a hat AND a teapot. It’s not the first time I became a cliché. Speaking of all things Dickensian, how about Bloomsbury? We walked and walked and walked through many areas of London yet it was bookish Bloomsbury that grabbed me and whirled me ’round and round in a heady state. He (Charles Dickens) lived here. She (Virginia Woolf) worked here. Indeed, the literary capital of London is chock a block full of intellectual giants. I put on my fangirl hat at the Dickens museum which salutes the great author’s life as a people’s champion as much as it does his writing. And then there are all the green spaces and elegant squares. And the Bloomsbury Publishing house (Harry Potter! ), the Royal Academy of Dramatic Art, the University College of London, where my oldest is a student. Just walking about these leafy streets and stunning architecture will make the densest feel like a smarty-pants, if only for a magic minute. Don’t forget: I’m still the dolt who lost her 100th umbrella on the Tube. Dancing at the JuJu’s Jazz Band Ball on Brick Lane. 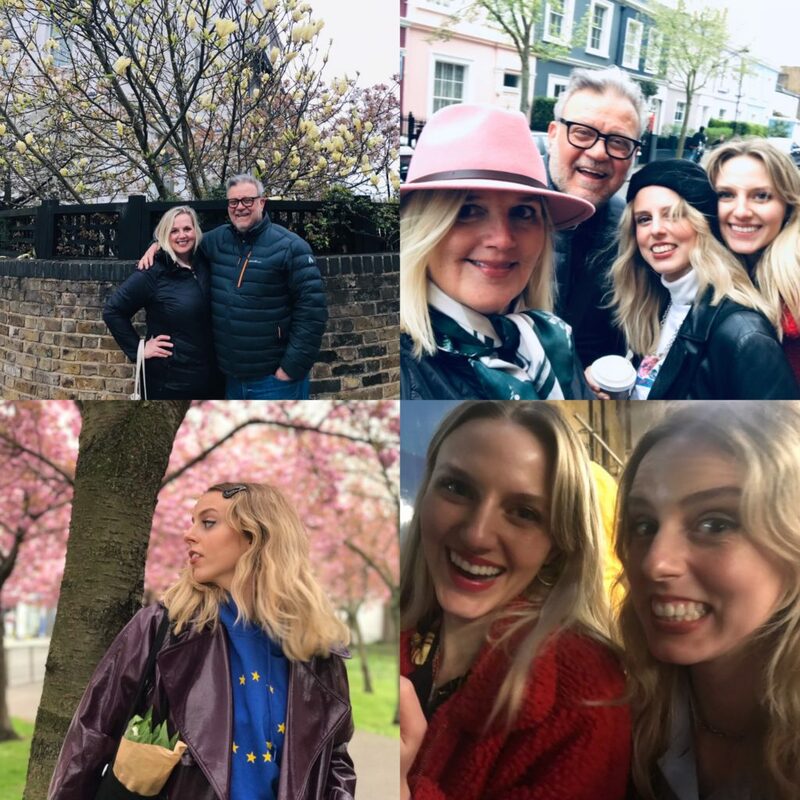 Theatre in London is renowned and plentiful and yes, we saw a play —All About Eve because the film is in my top ten and of course we had to see the theatrical adaptation—and lined up to meet the star (Gillian Anderson). It is okay to do this if you’re with me because we live over there, on the hill called EXTRA. But the most fun I had in two weeks overseas had to be at the JuJu’s Jazz Band Ball in Shoreditch doing the Lindy Hop (very poorly) with my guy —and also some tipsy Irish dude who thought he was being gallant asking me to dance until I said, come, meet my FAMILY who is here with me. This funky event space has weekly Brazilian and Cuban live music, and funk and soul on other nights, but come Saturday, a swing dance revolution is in full swing and you cannot escape it; total immersion. If you don’t dance, you can watch an endless parade of cuties, some with pin curls, finding one another on the dance floor. London is full of these offbeat hidden clubs and no one was keener to dig them out then my travel buddies. More on that in a moment. The Queen’s view out her window at Buckingham. Yes, Liz has a great view. If you aren’t tired yet reading my list above, think of all the parks in London and then think of me dragging my posse and making them stop as I shrieked about yet another shrub. Hyde Park is lovely. Kensington has Peter Pan and his spirit is certainly sprinting about in the Princess Diana memorial playground. But it is the gorgeous green in front of Buckingham Palace, where I communed with the ducks and famous pelicans and took mental notes: I need that for my garden. Dreaming is free. That’s a very good thing in London. My kids live there, as students/ grown adults who don’t need their Mom to pick their outfits anymore. Their time there is temporary. Maybe forever, if one of them has her dreams come true. Time spent with them is my dream come true. I adore these creatures made of wonder and laughter and homemade macaroni casseroles. They know how to capture magic and remind me that being their mother remains my best gig. I am counting the days until our next sensory overload. (PS Yes, honey, I didn’t forget the Fulham soccer match. A total blast sure to makeeveryone‘s top ten).